No need for the drive-through. 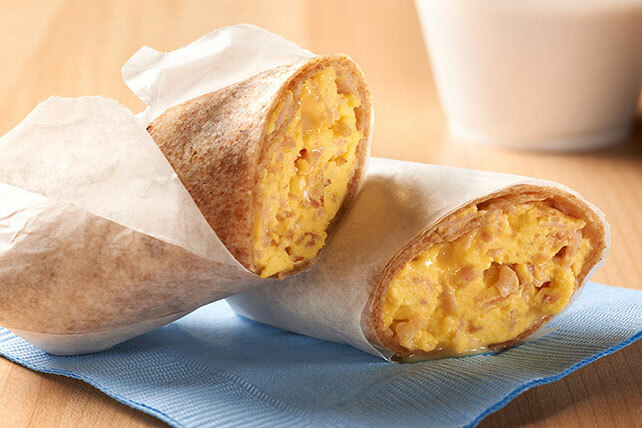 This tasty wrap combines ham and eggs with melty cheese and gets you out the door in 5 minutes flat. Beat egg in microwaveable bowl; stir in ham. Microwave on HIGH 1 min. 15 sec. to 1 min. 30 sec. or until egg is almost set, stirring after 45 sec. Spoon down center of tortilla; top with Singles. Fold in opposite sides of tortilla, then roll up burrito-style. Substitute 1/4 cup cholesterol-free egg product for the egg. Prepare using your favorite OSCAR MAYER Ham.